This has everything. From smoke, to sweet, to tart and savoury, plus that velvety meringue top we all love. 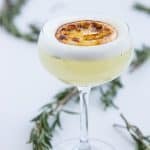 I can’t tell you how much fun I had creating this cocktail and I’m excited to share this Bruleed Lemon Rosemary Sour for you today. After a bit of trial and error (I kept burning my lemon wheels on broil…. ), I’m finally able to share this outstanding tipple with my fam! 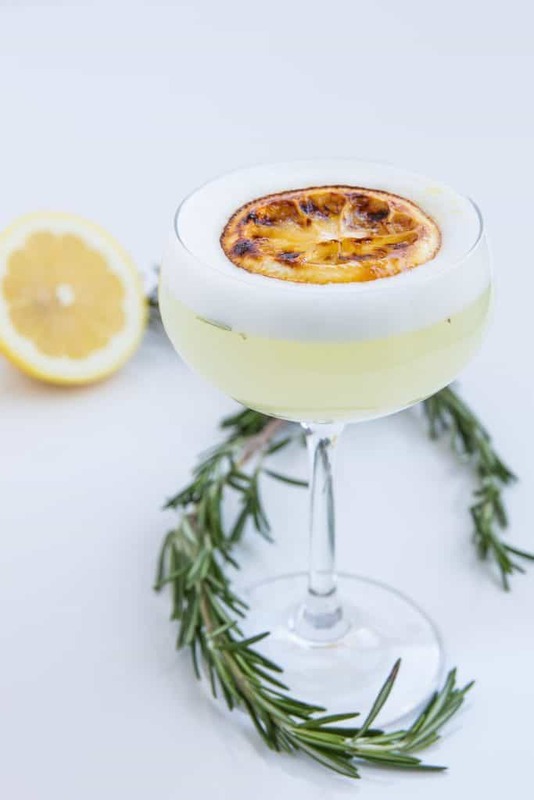 The inspiration for this cocktail came from a recent trip to Chicago, where we stopped at Boka Group’s Bellemore restaurant and had the most delicious Lemon Semifreddo dressed with a touch of Olive Oil. 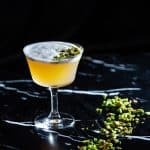 I seldom see oil used in cocktails, but the combination of lemon and oil just spoke to me and I knew I had to create a cocktail around this concept. I tested out whether I would shake the oil with the cocktail or simply place a drop over top of the egg whites, but in the end, I loved how the olive oil gently mixed with the Egg Whites right on top of the foam. 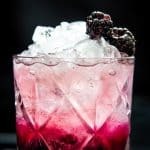 I can’t tell you how many times my cocktails have been inspired by food. It’s one of the reasons why I try to always have a food show going on in the background while I’m working from home. Whether it’s a new technique, or a new flavour combination, I’m always keeping my eyes and ears open. It also explains why ‘The Flavor Bible’ is one of my most used and abused book on my shelf. 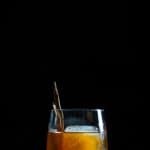 It has come in handy SO many times, especially when I needed cocktail inspiration or trying to figure out a pairing at home. Everyone needs this book in their life! I’m also clearly in a ‘sours’ phase. This happens all the time. 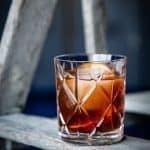 I’ll have a month where all I want to drink is Manhattans, and then I’ll have a sweet tooth for Cocchi Rosa with an orange zest for a good 2 weeks. I think with summer and warmer weather slowly creeping into the city, I’m already picturing myself with a tiki mug in hand and sours are the next best thing. Now with this ‘semifreddo’ in mind, I wanted some sort of creamy texture to incorporate into the cocktail, and that’s where the Egg Whites came to play. Now I decided to do something different and switched out the typical Simple Syrup with Orgeat Syrup instead. This ties in the nuttiness and the Semifreddo feel with that bright hit of lemon. Then there’s the addition of Rosemary, which I slightly burnt to release some of its aroma and add a unique savoury smoked element to the cocktail. It rounds out the lemon and one sprig does just the trick. Thirsty yet? 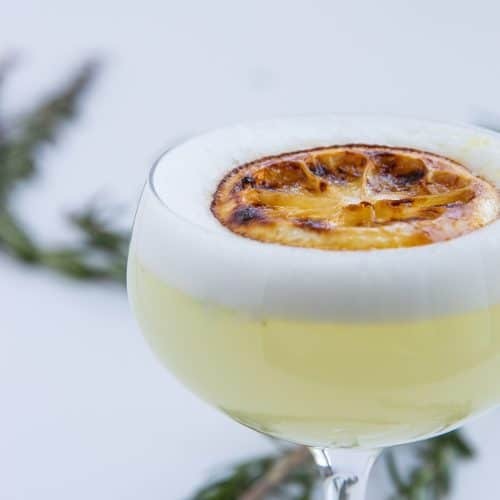 A refreshing take on the Lemon Brulee with lightly burnt Rosemary, Martin Miller's Gin, Fresh lemon, Orgeat Syrup, olive oil and egg whites! Add all ingredients (except Olive Oil and lemon wheel) into an empty shaker, and dry shake for approximately 20 seconds. To Brulee Lemon Slices, I simply got Lemons into thin wheels, coated them in granulated sugar and put them on Broil for approximately 10 minutes. Make sure you are paying attention to the oven (because the timing may be off depending on your oven and conditions). They will quickly burn if you're not paying close attention (like I did). As soon as they start to brown, let it bubble for 30 seconds before turning off the oven. Leave it in the oven for a couple minutes before taking it out, and make sure they it is placed on top of aluminum foil if you don't want to deal with a mess! In addition, if you want to know how the Orgeat Syrup is made here in Liquid Culture, follow the link attached! It's not exactly the traditional method, but I love this mix either way!